Niguma was born in a region called the Land of Great Magic in Kashmir, India. At that time her father was the Brahmin Shantivarman (bzhi ba’i go cha) and her mother was Shrimati (dpal gyi blo gros ma). She was the sister of the Great Sage Naropa. During this life time, having chosen voluntary birth as a woman who would benefit and liberate others, she received a little instruction from a few accomplished spiritual masters and, based on their teaching, directly saw the truth of the nature of reality. Her illusory body of obscuring emotions appeared as a pure body of enlightenment. For her own benefit, she perfected abandonment and cultivation. For the benefit of others, she manifested the two form bodies and will continue to do so until samsara is completely empty. She received a few instructions from the master Lavapa of the East. 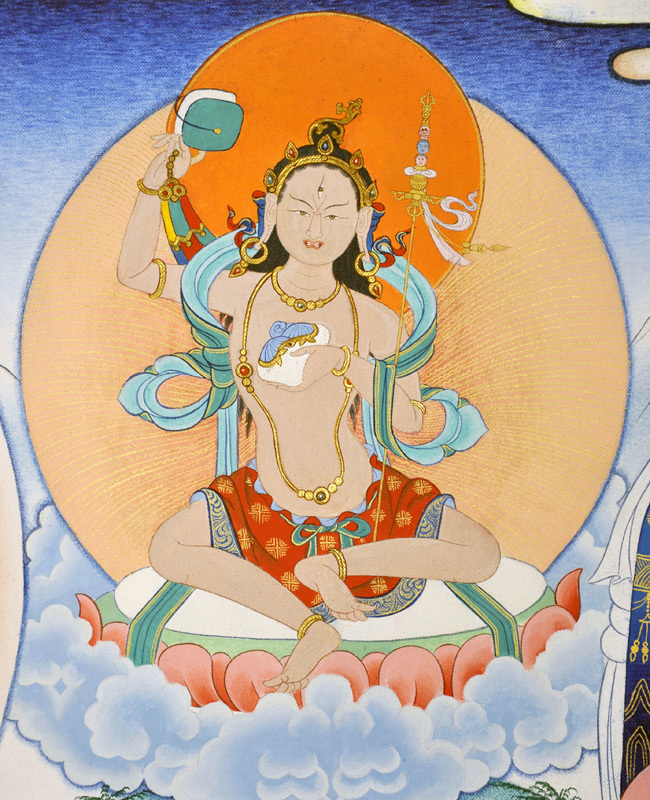 After meditating with the master for one week, she became a wisdom dakini, who exhibited a rainbow like physical form and attained spiritual realization that reached awakening’s eighth stage. It is said that Lavapa of the East’s body dissolved into light, leaving only a palm-sized portion of the crown of his head behind. He was also known as Lavapa the Younger. She is called Nigu, Nigupta in Sanskrit, said to mean ‘definite secret’ or ‘definitely hidden’, although her name is really from the dakinis’ symbolic language. Niguma received the ultimate teachings directly from Vajradhara, the primordial Buddha, in the form of personal initiation into all levels of the teachings —Sutra, Abhidharma, and Tantra. As a result, she manifested as a tenth stage Bodhisattva; this means that even the subtlest obscurations were dispelled, so that her mind became one with the mind of the Buddha, attaining the Three Bodies of perfect Enlightenment. Her foremost disciple was the Mahasiddha Khyungpo Naljor, who was born in Tibet and traveled to India to receive the full transmission from her. In granting him the empowerments, Niguma also confirmed that not only he, but also all his successors and followers would in the future have the good fortune to receive the blessing of dakinis, encounter enlightened beings, and attain perfect liberation. Niguma granted the four complete empowerments to the adept Khyungpo Naljor in the emanated mandala and transmitted the most profound tantras, intimate advice, and oral and written teachings. Niguma gave him the essential pith instructions that would enable worthy disciples to attain enlightenment in one lifetime. She promised Khyungpo Naljor that all disciples and Shangpa lineage holders would go to the Pure Land of the Dakinis, because this lineage was special above all others. Niguma commanded that for seven generations, these ear-whispered teachings should be only passed on in a one-to-one guru to disciple transmission. From her lifetime to this present day, she continues to manifest whatever subtle or more material form is necessary to benefit beings over limitless time. In particular, through her activity and blessings, she watches over those who preserve her lineage with a compassion that knows no distance; she blesses them and ensures the success of their enlightened activity.